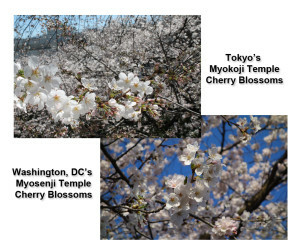 Myosenji Temple will host a series of educational seminars about Buddhism for the public, beginning March 22, 2015, in honor of Washington, D.C.’s annual Cherry Blossom Festival. The series will include lectures by Chief Priest Rev. Murata, instruction in proper use of Buddhist prayer (Juzu) beads and chanting to Taiko drumming. The series is part of monthly Learn Buddhism programs offered by Myosenji Buddhist Temple, a Japanese Buddhist sect. Myosenji Temple has a unique and special connection to Washington, D.C.’s cherry blossoms. Not far from Myosenji Temple (Silver Spring, MD), the first ever Japanese cherry trees in the United States were planted in 1906. David Fairchild, a U.S. Department of Agriculture official, imported one hundred flowering cherry trees and planted them on his property in Chevy Chase, Maryland. The success of his blossoms set in motion a series of events that lead to the gift of Japanese cherry trees from Mayor Yukio Ozaki of Tokyo City to the city of Washington. This gift included trees from a nursery called “Myo-Ka-en”(妙華園) which was adjacent to Myokoji Nichiren Shoshu Buddhist Temple (sister temple to Myosenji). It is of note that the Japanese characters Myo (mystic) and Ka (flower, but also “ge” in word “renge”) were used to title this property. Nichiren Shoshu Buddhists chant Nam-Myoho-Renge-Kyo. Fifty-nine varieties of cherry tree scions from Tokyo were grafted at this nursery which were sent to Washington. Myo-Ka-en nursery closed in 1921 but Myokoji Buddhist Temple still stands today with the same cherry trees we see in the Tidal Basin. Somei-Yoshino cherry trees grace Myokoji Temple (Tokyo), the Tidal Basin and Myosenji Temple (Silver Spring, MD). Families and children are encouraged to include a visit to a Japanese Buddhist Temple to spark learning of Buddhism and appreciation for the deep connection between Tokyo, Japan and Washington, DC made possible by cherry blossoms. The series will be held at Myosenji Buddhist Temple every Sunday afternoon during the cherry blossom season from 2:00 – 3:00 pm. Topics to be covered include “What is Karma?” “Buddhism’s Ten Worlds” and “Who is Buddha? What is Buddhism?” Visit http://nstmyosenji.org for more information and for the series schedule. Myosenji Temple is one of six Nichiren Shoshu Temples in the United States. Myosenji is the Nichiren Shoshu Buddhist temple for the Washington, DC region. Nichiren Shoshu means the orthodox sect of Nichiren. Myosenji Temple first opened in 1972 and moved to its current location in 1980. It has been serving its membership and the community for more than forty years. The temple is located at 310 University Blvd West, Silver Spring, MD 20901. Temple hours are 7am-8pm Monday-Friday and 9am – 5pm Saturday-Sunday. Follow the temple on Facebook, Instagram, YouTube, and Twitter. Call 301-593-9397. Website: nstmyosenji.org.